I am breaking up with my landline. After all these years—decades really—it’s time to retire my 212 number. 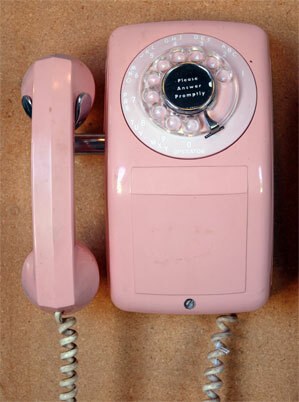 I grew up with a rotary phone. My parents had one installed in the kitchen, right by the sink, and the other lived in their bedroom. In those hallowed days of my childhood, using the phone could often be expensive. My parents counted the minutes, literally. In order for me to have a phone conversation, I’d have to do the dishes, thereby fulfilling the obligation of a chore while also doing something for myself—gossiping with a girlfriend. The green chrome hand held nestled firmly in my neck, I’d do my part to help my family. My mother, ever the nosy parent, would more often than not, pick up the phone in her bedroom, trying to glean some information about her daughter’s life. I caught on, immediately. My mother was not very stealth, after all. When I entered high school, my father got me my own phone line, that he had installed in my bedroom; he’d grown weary of the fighting between wife and child. A blue princess phone, push button; it was everything I’d wanted, my father was my personal Santa. I used that line to talk as well as dial up my modem to the world, my personal Idaho. I have since lost count of how many 212 numbers were issued to me, a bill payer, in my lifetime. This most recent 212 number has been mine for the whole of my daughter’s life, maybe longer. There is no one listening in anymore. There is no need to plug in a modem. There is no need to spend the extra 70 dollars a month on a line that telemarketers seem privvy to. Really, it’s come down to this: if someone is looking for me, they know how to find me. And so, I bid goodbye to my 212. I hope your next owner appreciates it as much as I have. I am a huge fan of Stacey Abrams. Watch this. You’ll be too if you’re not already. Victory for a New Yorker. I don’t think we’re at Peak Screen just yet, I think it’s going to get worse, but whatever. Barbie is a working gal. And now have a laugh with Anjelah Johnson.